I wanted to make an old bay crab cake to take to a family cook out. 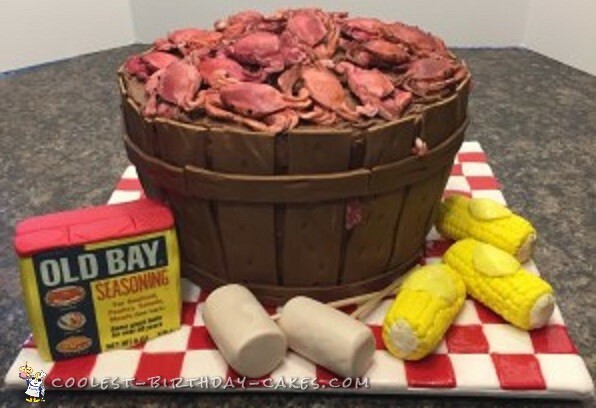 The bushel basket was all cake covered with fondant. I made all the crabs out of fondant and dusted each one with red, orange and yellow petal dust. I made the two ears of corn and the two mallets with Rice Krispie treats and covered them with fondant. I make the old bay can out of Rice Krispie treats, covered with fondant and used my edible printer for the label. The cake board was red and white squares out of fondant and brushed with vodka and corn syrup for shine. It was the hit of the party and no one could believe that they were edible. It was a while before someone decided to cut the cake! I always try to make something different for our parties.